In the 1970s, video games were just starting to find their commercial foothold. During this decade, classic arcade cabinets containing games like Pong (1972) and Space Invaders (1978) would begin passively stealing quarters from wide-eyed children. Cinematronics, the company behind the game, never received permission to use the Star Wars license, and I’m not sure they ever asked for it. They just decided to make a game where players flew through a trench in an ambiguous-but-Death-Star-looking thing while shooting at TIE fighters (and, admittedly, other types of ships as well). I don’t really know much about 1970s copyright law, so I’m not going to go into legalities here, but suffice it to say this was a Star Wars game in all but name. The game seemed to have luckily dodged some other legal issues as well. The cabinet was so top-heavy that it had a cinderblock inside it to prevent it from tipping over on top of players. To my knowledge, Starhawk didn’t end up physically crushing any children, but the risk for injury was present (though perhaps unlikely). It seems like, for its time, it was a relatively successful game, but Cinematronics had a sketchy history with Vectorbeam, a company formed by former Cinematronics employees, as well as a lot of financial woes. It would ultimately go under in 1986. Considering the 1979 (or 1977, which seems unlikely) date of this cabinet, the gameplay looks incredibly smooth, though I’ll admit that I’ve never been given the chance to play this in person. I have, however, spent extensive amounts of time playing Starblade, both on the original arcade cabinet and on Sega CD, and I imagine the experience would be similar (though far less colorful and complex). Starhawk is an arguably unimportant game, though it’s an interesting one. Its history is surrounded by unfortunate events, and it occupies the strange niche of blatant Star Wars ripoff games that came out before George Lucas and company had even finished a second Star Wars film. 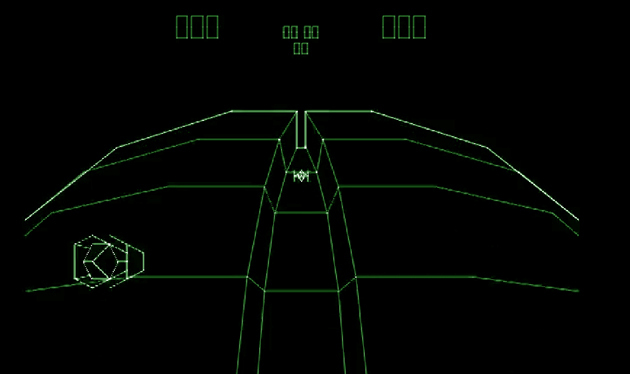 The Death Star trench run is a gaming scenario that’s been reproduced countless times since then, but Starhawk was the first game to bring that experience to (dangerously top-heavy) arcade cabinets, and I suppose it deserves a mention for that fact alone. I really liked Starhawk for the PS3. Until they added all that microtransaction BS. I was a HUGE evangelist for that game when it was new, and then all of a sudden I noticed that everyone was using huge, upgraded mechs. Then I found out that I had to pay for those, and I got really mad and never played it again.